Extra Large! By Using PLA Material Extracted from Corn Stalks, The Lamp is Odorless and Non-toxic. 1 Moon Light. Stepless Dimming - Long Press to Adjust Brightness Steplessly. Dual Color - Cool White (6000K) to Warm White (3000K), Different Color Brings Different Feeling. | eBay! 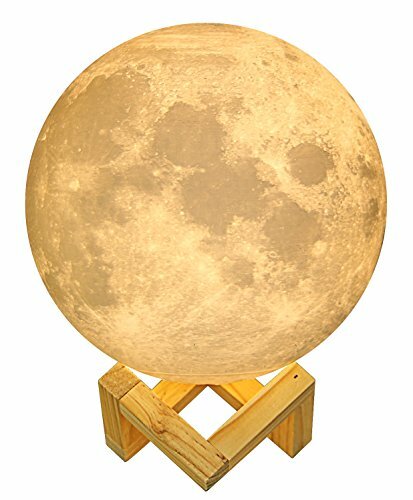 - 【Advanced 3D Printing Technology】 The Moon Light Perfectly Reproduce Luna Surface, Looks Just Like a True Moon in Your Room. - 【Quality Guarantee】 Gurantee Refund or Replacement for Defective Lamps. - 【Safe and Reliable】 Adopting Low Voltage USB Charging And Energy Efficient LED Light Bulb, The Lamp Stays Cool Even After Long Time Use, and Gives Off Fliker-free Soft Light Which Would Not Hurt Eyes. By Using PLA Material Extracted from Corn Stalks, The Lamp is Odorless and Non-toxic. - 【Touch Control and Memorable Brightness】Long Tapping Smart Button to Easily Adjust Brightness. Your Previous Brightness Setting Will Be Memorized for Your Convenience. - 【Dual Color】Short Tapping Smart Button to Change Color Between Cool White (6000K) and Warm Yellow (3000K), Different Color Brings Different Feeling.